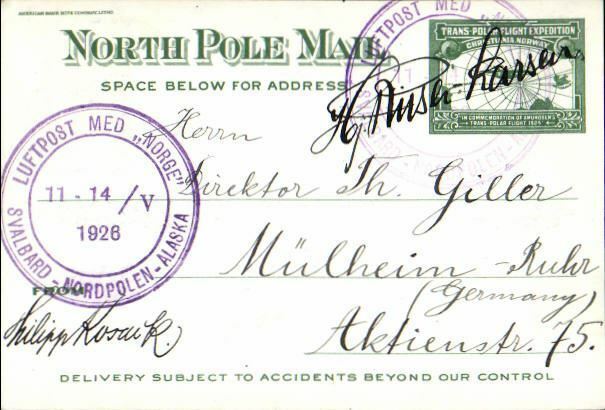 Polar Expeditions: Arctic: 1926 Amundsen-Ellsworth-Nobile ''Norge'' Expedition, North Pole Mail card addressed to Germany and signed by Riiser-Larssen (Amundsen's navigator and second in command) over one of two strikes of circular ''NORGE'' cachet dated ''11-14/V/1926''. Wilkins North Polar Expedition, plane damaged when landing on the north coast of Alaska, cover inscribed "1200 miles over Arctic Sea by Airplane, Lat 77.45N, Long 175, 100 miles on foot to shore", large circular violet "Detroit News Wilkins Expedition" cachet autographed by Sir Hubert Wilkins, also signed "H. Wilkinson/Fairbanks/Alaska" in pencil on front, postmarked Barrow, Alaska April 30th, 1927, bs Fairbanks, Alaska, May 16th. Nierinck 270430. Historical item in superb condition. 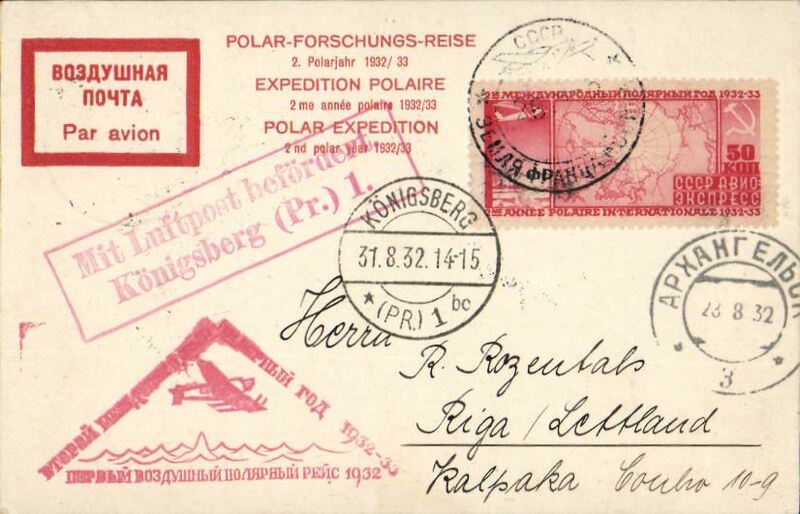 Polar Expeditions: Arctic: 1932 Second Polar Expedition card to Germany , franked Russia Express 50k. cancelled Aug. 26 with cachets, Archangel and Berlin transits, see scan. 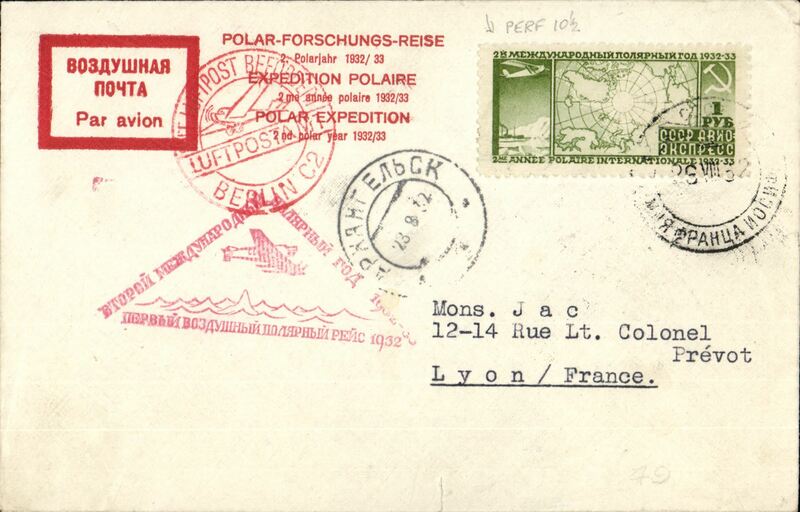 Polar Expeditions: Arctic, 1932 Second Polar Expedition card to Paris, bs 1/9, via Berlin 31/8, Sieger cover franked green Russia Express 1r cancelled Aug. 26 , red triangular cachet and Archangel and Berlin transits, see scan. 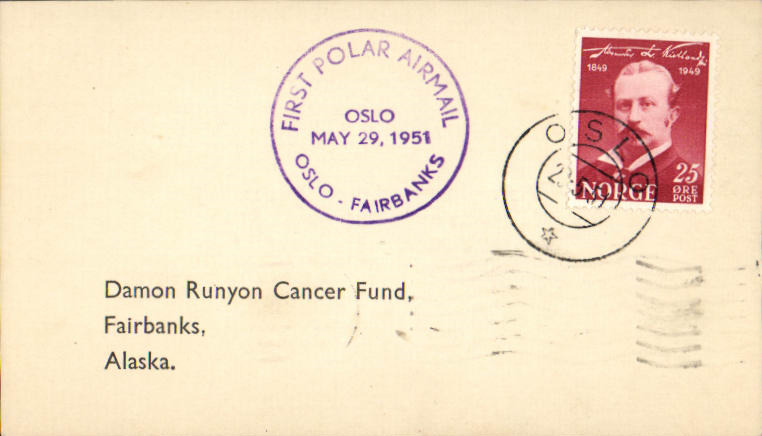 First Polar Air Mail, Oslo to Fairbaks, Alska bs 29/5 card addressed to a First polarAir Mail, Oslo toFairbanks, bs 29/5, card addressed to the Damon Ruyon Cancer Fund frnked 25o, violet circular flight cachet.